Well the day for the checkride has finally arrived. I told the examiner that I wanted to do it early today, but he set up a time at 8 am. That was a little bit earlier than I had planned on, but it is doable. The only issue with a checkride that early is that I have to get there before the examiner and get the plane ready, plus before I get to the airport I have to check the weather, etc. It makes for an early morning when you have to be ready to go by 8:00. So I was up early today checking the weather and getting ready. I got out to the airport about 7:45 which was enough time to get the cover off the plane and plug in all my electronics. I was going to wait and do the pre-flight right before we flew the plane. Once I got that done, I scooted back up the the flight school to be there when the examiner arrived. I got a few minutes to relax before Brooks, the examiner arrived. This was the same guy I used for my Private checkride, so I knew what I was in for with him. Shortly after he arrived, Paul showed up. The first thing Brooks did was go through my logbook to make sure I had all the hours I needed. He commented that I had just barely enough. Which I did, at 40.1 hours, but enough is still enough, so he was fine with that. 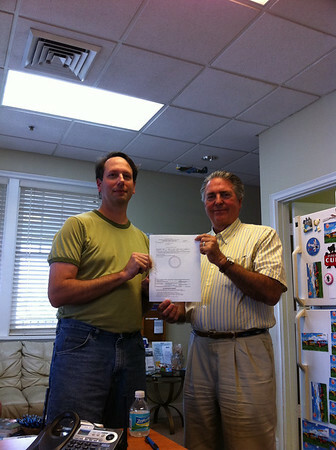 Next, we all completed the FAA IACRA application. Paul had reviewed it earlier in the week, but he wanted Brooks to check it before he “signed” it. Once it is signed, no changes can be made, so everyone wants to make sure everything is right. Then Brooks signed into his IACRA account and did his thing, then I had to sign into my IACRA account and “sign” the completed application. Then we were ready to start the oral exam. The oral exam started out with just some general chit-chat. Brooks did this last time to help get people to relax. I will say that I was much more relaxed for this checkride than for my last one. Probably because I had been through it before, but also because I knew that even if I didn’t pass, I could still go out flying (just not in instrument conditions). So I guess I felt a little less pressure. We started by talking about how to stay instrument current, and then went into looking at the enroute chart and discussing that, and then looking at the approach plates and discussing that. Finally, we reviewed my flight plan Brooks had me create. He wanted me to do a flight plan from North County to Key West. I did as he wanted, but the problem with that flight is that there are only GPS and NBD approaches into Key West. If the weather was actually IMC, there is no way I could get in there since I don’t have any of the equipment in my plane required to fly those approaches. So the only way I could actually fly that route was if it the weather was VFR. Of course, if the weather is VFR I don’t actually need an instrument rating anyway. Well, we made the best of it, but that brought on more questions about GPS approaches which I really don’t know too much about since I have never flown one. The oral exam when OK, but I was not 100% percent on all of my answers. There were several things that I got stumped on and had to look up, and there were a couple things I just didn’t know. But Brooks eventually said we should go out flying, so I knew I had passed the oral exam. If the oral exam was a complete failure, we would not have gone flying. I was a little worried about the weather this morning, since we are supposed to get about six inches of rain this weekend. Most of it is going to be on Saturday and Sunday, but conditions would be slowly deteriorating throughout the day here. There were already showers coming onshore and I hoped they didn’t get in our way flying today. The other concern I had with the weather was the winds. Winds were forecast to be out of the east at a whopping 20 knots, even as low as 3000 feet AGL. It was real windy on the ground, but by looking at the clouds you could tell the wind was whipping pretty good up high. We walked out to the plane and I did a quick pre-flight. Winds were right down 8R, so I taxied on over and did my run-up. Then we were off the ground. Brooks took the plane while I lowered my hood and the practical exam began. First Brooks had me fly out to the west. After we got west of the airport (I assume) he covered up my Attitude Indicator and my Directional Gyro so I could demonstrate partial panel flying. After a few minutes of straight and level flying, he took the controls and we did two unusual attitudes. One was a climbing left turn, and the other one was a descending right turn. I had never done a partial panel unusual attitude during training, so I used what I knew and recovered from both of them without a problem. I was a little surprised by that, though. Then, while still flying partial panel, he vectored me around for the Localizer approach to runway 8R at F45. Since both my VOR heads have glide slope needles, I just had to ignore the glide slope and fly the localizer only. I did pretty well with that, and flew down the the minimums where he had me climb back up and then he vectored my back around to the west. At that point he removed the covers over the AI and DG and I had the whole panel back again. Next he set me up for the ILS 8R approach to F45. This time, I remembered to identify the radios so I did that while I waited for the localizer to come in. I should have done that before the last approach, but by the time I remembered I was already descending and I decided that identifying the navaids was too much workload that far into the approach. Brooks didn’t say anything, but I was making sure I did everything that needed to be done. The ILS was very nice, with hardly any movement of the localizer needle or the glideslope needle. Even though it was windy up there, once you were about about 700 feet AGL it was smooth. I did have to fly the tail end of the approaches down in the bumps, but I still did OK on that part, too. At the end of the ILS approach he had me fly the published missed approach up to MORGA. I did that fine, although I knew I was going to have a pretty good crosswind at the hold, since the hold is mostly north-south and the winds were out of the east. I flew the hold one time around, and when I turned back on the inbound course, I could see the needle deflected to the east, so I knew the wind had blown me back to the west. I was still well within the standards. One more time around and I could have had it, but Brooks was satisfied with just one trip around. He sent me back towards the west for the last approach (the checkride is three approaches; one precision and two non-precision). As I was heading back west, he wanted me to copy down a clearance. He gave it to me, and I wrote it down. Then I flew the clearance, which was basically to intercept the VOR approach final approach fix DUFUS and then fly the VOR approach into F45. I had to do a procedure turn to get turned back around to the east and then he “cleared” me for the approach. I flew the VOR approach towards the airport and when we got about a mile out, he had me take off the hood and land. Overall, I felt pretty good about the practical test. I was never confused by what he was asking me to do, and I kept the needles pretty well lined up the whole time. I actually felt pretty confident during the whole flight and was pretty sure I passed once we landed. Once I had the plane pulled into the parking spot and the engine shut down, Brooks told me I had passed! He said the flying was excellent, but the oral was not as strong. I felt the same way, but the bottom line was I had passed. Brooks headed back up the the flight school to finish the paperwork and I tied the plane down. Here was the path for the practical exam. You can really see how much the wind was pushing me to the west. I actually thought this would look a lot better than it does, because the needles were where they should be. Just goes to show you how much error is in the VOR signal. Plus, it was really windy. The approaches into North County look pretty good, though. Once I got up to the office, Brooks had all the paperwork done. I signed my name on a couple forms and he cut up my Private license. I am flying with a temporary one until my new plastic one comes in a couple of weeks. Except the new one will say “Instrument Airplane” on it! So that’s it, I have my instrument rating. I’m pretty happy about it, but to tell you the truth I am more relieved than anything else at this point. I have been studying for this for basically an entire year now. At this time last year I started the night classes to prepare for the written exam. I took that in December last year, and started the flight training in March, seven months ago. So it has been a long haul. Thanks to Joel, my instructor for most of my training, and also to Paul, who finished me up and prepared me for the checkride. Also thanks to my safety pilots Douglas, Winston, John, and Paul. I owe you one. It is that last line that was the surprise to me. I did not realize how many hours would be discounted for “ground ops.” Anyone who is reading this and contemplating getting an instrument rating should be aware of this potential for additional hours. Just don’t figure out your budget for 40 hours of instrument flying. About 25% of your flying will not count towards the rating. I’m not sure if that is a universal thing around the country, I suspect not, but that is what is done around here. Tailwheel Endorsement: This isn’t a rating, but rather just a logbook endorsement from an instructor. It is required to fly tailwheel aircraft, and although I don’t have a tailwheel on my plane I think it is something I should learn how to do. It only takes 5-10 hours to learn how to land a tailwheel plane, and no checkride, so it is not a big commitment to get it. Commercial Certificate: This would allow me to be able to get paid to fly. There isn’t a lot you can do with just this, but it does allow you to do things like ferry planes and tow banners. I see it as more as an “enabling” certificate than anything else. That is it allows for opportunities to get paid to fly, something that I am not allowed to do at the moment. This is more of an “experienced” based certificate, in that most of the requirements are based on flying experience. Right now I already have just about all the experience required. It does have a written test and a checkride, though. Everyone seems to think that this is the easiest rating to get, too. Much easier than the instrument rating. It also requires using a plane with retractable landing gear and an adjustable pitch prop, neither of which my plane has. Glider Rating: This would just be something fun to do, maybe take a week of vacation and go get it done somewhere. There is no written test since I already have a pilot’s license, but it does require a checkride, and a glider. So those are the things I am contemplating for future training. But as you can see, any further training is going to require me to rent anther airplane. There is not much further training (at the moment) that I can do with my plane. This is not really a problem, but it does add to the expense. I’ll probably do another blog for the next training, whenever that is, so keep checking back.